The Christmas ballet ‘The Nutcracker’ is a popular worldwide event that’s become a tradition for families. For myself, my daughter performed in a local dance recital as a piece of candy in “The Nutcracker” at the age of five, and this mom beamed with pride. Since that performance, we attended yearly performances of the ballet, becoming our annual mom/daughter Christmas outing sitting among many other females. 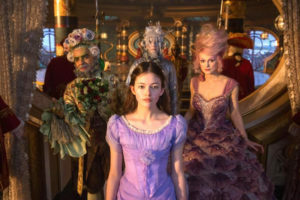 Quite noticeable in “The Nutcracker and the Four Realms” film is the addition of a male character as Clara’s (Mackenzie Foy) protector (Captain Phillip) in the Four Realms. In chatting with two 11 and 12-year-old boys after the movie, they said they liked the film, with Captain Phillip’s (Jayden Fowora-Knight), character being their favorite and the crazy plot twist that involved him. Here’s my dilemma of turning the beloved 1892, Pyotr Ilyich Tchaikovsky music that accompanies Hoffmann’s two-act ballet ‘The Nutcracker and the Mouse King’, and later Alexandre Dumas’s The Story of a Nutcracker. 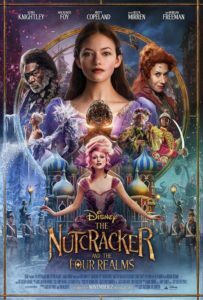 into a war of wills that includes violence between the Sugar Plum Fairy (Keira Knightley)—she creates an army of soldiers that use swords while Mother Ginger Helen (Mirren)—cracks a bullwhip to keep the giant soldiers at bay. 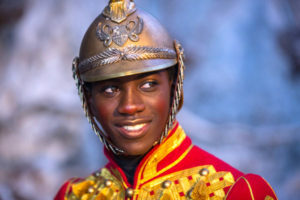 Yes, it’s great that boys have more to identify within the ‘Nutcracker’ per se, but is the role model of sword fighting, kicking, and shoving sending a positive message of behavior? I, for one, don’t think so. Unfortunately, that’s only one of the problems I have with the film. To be sure, there are plenty of delightful story elements happening, as in Clara’s exceptional character traits. She’s determined, brave, strong-willed, and gifted in math and science. Her leadership comes into play during the second half of the movie. We can thank screenwriter Ashleigh Powell for creating a solid role model. Ballet dancer Misty Copeland’s beautiful dancing is a treat to behold! She’s also made history as the first African American Female Principal Dancer with the prestigious American Ballet Theatre. The glaring errors are in the lack of dialogue for Shiver (Richard E Grant), an amazing actor that needed more depth along with so many other characters. Misty Copeland Principal dancer with the American Ballet Company. Directed by Lasse Hallström and Joe Johnston, the film starts with Clara receiving a Christmas gift from her late mother that leads her to a fantasy land, filled with magic, although beset by growing disharmony between its four Realms: the Land of Snowflakes, the Land of Flowers, the Land of Sweets and the mysterious Fourth Realm. While these beautiful set designs are stunning with each drawn from the previous Nutcracker story’s rich history, it’s essential that each have a sense of life to them. Again, greater script development is needed here. Mother Ginger (Helen Mirren) is dressed like a shabby pirate; in a torn jacket and boots, her face has deep black scars that look like a cracked porcelain doll. The prior Mother Ginger is a comical character, who parades around on stage wearing a blouse and giant hoop skirt, so an army of her children can emerge. Yes, Mother Ginger has an expanded role, yet her bullwhip seems out of place in a holiday Christmas film. When she cracks the whip, she rips off the arms of giant tin soldiers who are trying to kill her and destroy the Realm. A big mistake in my mind, this is supposed to be a family holiday film, there’s no place for this kind of blatant, crude violence. The Sugar Plum Fairy is also depicted as evil, and again this is strange. She wants to be Queen, creating a giant-sized army to fight everyone from the other Realms. The story is changed into a battle for the Realms, bringing Clara front and center to fight for what is rightfully hers. The explanation does come near the end of the film; however, it just doesn’t work in a holiday film. Finally, since this is Disney, where are the new original catchy songs? Tchaikovsky’s overtures do play throughout the film, yet nothing new to keep us interested. The bottom-line: Foy’s strong performance as Clara can’t save this over-stuffed film that lacks heart, and a believable story.